There are many attractive wedding party hairstyles that brides-to-be can choose for their special day. By coordinating the bride's hair with the maid of honor, bridesmaids, and flower girl, the entire bridal party will have a lovely, elegant appearance for the ceremony and reception. 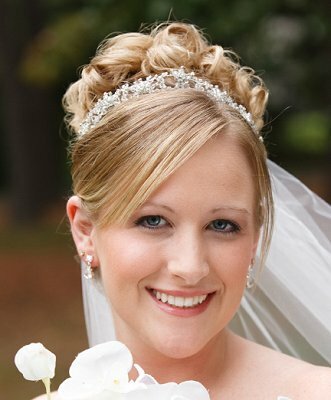 When choosing bridal party hair styles, brides must be aware that not every type of hair style will work for everyone. Different face shapes, hair textures, and hair lengths can all affect how suitable a hair style is. Fortunately, there are many ways to coordinate a great look with different types of hair. Adding similar bridal hair pieces to each style, for example, will keep the looks coordinated but allows each individual to have an attractive style that suits them personally. Similar styles don't need to be identical. For more wedding hairstyle ideas, be sure to visit Wedding Updos, Beach Wedding Hair, Soft Updos for Weddings, and the many other wedding hair articles available at LoveToKnow Hair.